The Toyota Highlander holds an enviable place in the lineup of sport utility vehicles. Simultaneously reliable, attractive, and safe, the 2019 Highlander is the ultimate family mobile. Sure, you could probably find bigger SUVs, stronger SUVs, and cheaper SUVs. But the Highlander hits the sweet spot, meeting you just where your needs are. The 2019 model year of the Toyota Highlander remains largely unchanged from the 2018. But there are a few differences that will catch your eye. Now every Highlander comes with black side rocker panels. This panel is located just beneath the doors and protects the vehicle from debris from the road or trail. In addition, the wheels are also black on the SE trim, as are the head lamps, tail lamps, wheels, and fog lamp surrounds. Finally, Limited and Platinum trims get chrome-trimmed LED foglights that are sure to light up the night. We’ll preface this section by saying that if you’re looking for a speed demon, the Toyota Highlander is not your car. That being said, the Highlander does offer a powerful V6 engine that gets above-average fuel economy. Unless you’re squeezed for cash, we recommend skipping the base engine, a tepid 185-horsepower 2.7-liter 4-cylinder through a 6-speed automatic transmission. The 295-horsepower V6 engine with 8-speed automatic is much better, in addition to getting better fuel economy too: 20 city miles and 27 highway miles per gallon. There’s also a hybrid V6 engine good for 306 horsepower. The hybrid gets the best gas mileage, of course, at 30 city miles and 28 highway miles per gallon. 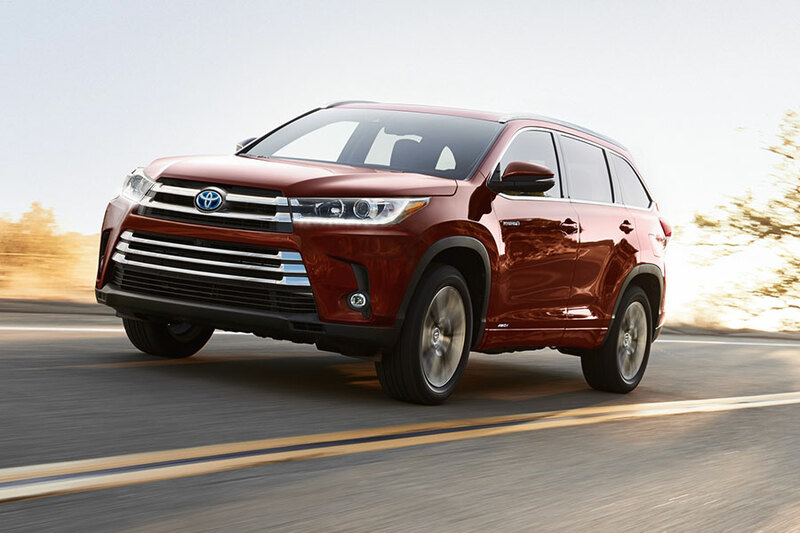 The standard transmission system is front-wheel drive, but all-wheel drive is available on any Highlander. Finally, the Highlander is slated to tow up to 1,500 pounds, when properly configured. That’s not a lot, but it keeps pace with competitors’ towing capacities and is definitely useful for trailers and a couple of light recreational vehicles. It’s hard finding that sweet Goldilocks zone, where everything is just right, but the Highlander seems to have figured it out. The 2019 Toyota Highlander is one of the few three-row sport utility vehicles that has decent fuel economy. The first and second rows have comfortable, supportive, and spacious seating that’s sure to please. The third row, while not big enough for adults to feel comfortable for long, works just fine for kids. You’ll get what you need when you need it from the Highlander. The cargo space also gives you what you need, a space that’s not too cavernous but also not too small. If it were any bigger, the third-row space would shrink or disappear altogether. If it were too small, the cargo space wouldn’t be useful for what you’d need to haul for that many passengers. At almost 14 cubic feet with all the seats up, and 84 cubes with them all down, the Highlander again feels just right. The 2019 Toyota Highlander earned five stars overall in its government and highway safety crash testing. That’s great for peace of mind. 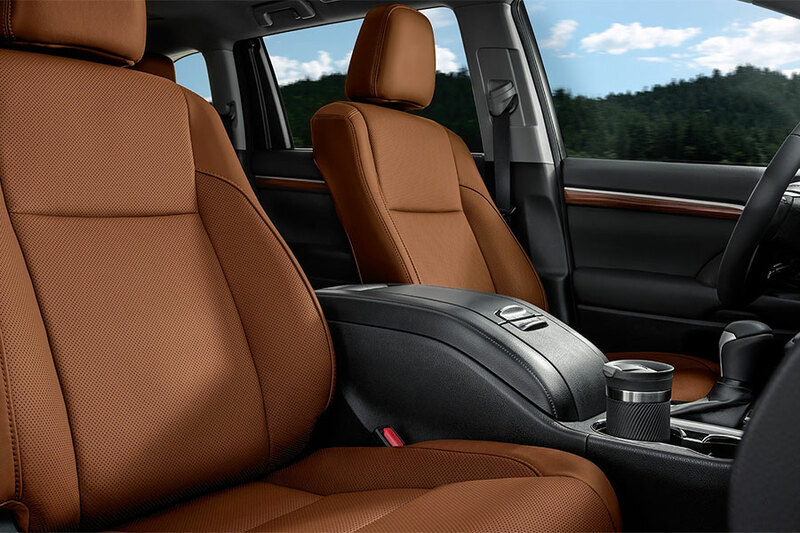 Toyota also puts its Safety Sense active-safety suite in every Highlander. This suite includes automated emergency braking with forward-collision warning, lane-keeping assist, lane-departure warning, automatic high-beam headlamps, and adaptive cruise control. Additional features are optional, such as blind-spot monitoring and parking sensors. The Toyota Highlander is one of the safest vehicles on the road.